Our 72nd independence day was celebrated this year in the company of our guests from 'Mission to the Blind ‘, Coimbatore. The team was headed by the Founder Ms. Jaya Gunaseelan. The function started with student’s parade at 7.10 AM; after which they assembled for Flag hoisting. 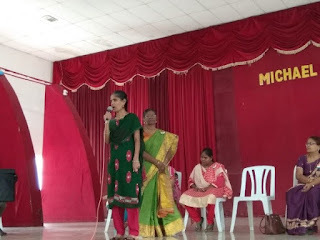 The students presented speeches on the significance of the day in Hindi, English and Tamil. Ms. Jaya Gunaseelan hoisted the national Flag and gave an inspiring speech on Life and liberty. She began her speech with a message from the Bible and concluded with a meaningful thought. The students sung patriotic songs and the sweets were distributed. The sweet distribution session was followed by a Programme called "Mission for the Blind. The team had four visually challenged people and four people with normal eye sight. Out of all Ms. Rani and Mr. Ramesh (visually challenged) presented their musical skills and Ms. Rani explained how they are able to a life with the disability and insisted that the society should not be sympathetic but instead give opportunities to enable them live a good life. They inculcated immense positivity amongst our students by their speech. Ms. Jaya Gunaseelan explained children about the skill training their centre is giving to the visually challenged and how such work gives meaning to their lives too. The program was concluded with a Vote of Thanks rendered by Ms Anitha, Principal MJC School. After the function the guests, students, staff and the parents were served breakfast. Thank you for sharing a great article. Joining management skills programs really take career a step ahead.